Office 365 is Office, where and when you need it. More than that, Office 365 brings together the familiar Microsoft Office desktop applications with cloud-based business email, shared calendars, instant messaging (IM), video conferencing, and file sharing. And because Office 365 was built from the ground up to be ‘mobile first, cloud first’, it works across all your devices. With enterprise-grade tools, robust security, built-in redundancy and a financially-backed 99.9% uptime guarantee for a predictable monthly cost, Office 365 is the easiest way to work together! As one of the leading Office 365 migration specialists in the world, getsix® Services is perfectly equipped to help you move to Office 365 in a cost-effective, efficient and seamless migration that will forever transform the way you do business. Moving any organization to Office 365 is a multi-phased project that requires expertise in project management, change management, technical consulting, and technical support. getsix® Services: Office 365 Migration Solutions enable you to draw on getsix® Services expertise and experience to migrate seamlessly to Office 365 – on time, within budget and with minimal disruption to your business. Want your business to function smoothly? Want to reduce downtimes and increase in-house efficiency? Want to let your employees work as easily from home or elsewhere as in the office? 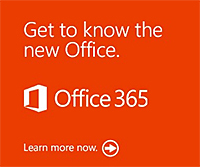 If your answer is yes to all these questions, then Microsoft Office 365 is the answer for you. Microsoft Office 365 lets your employees to work with the Microsoft office tools that they love from anywhere. In fact, you even get a high-quality email client, conferencing tools and other IT and business related tools when you decide to install Office 365. Why your business needs Microsoft Office 365? With this product, you can create a robust and effective website for your business that is easy to maintain and presents almost no hassles. Experience no more delays and miscommunication as emails and calendar tools in this suite of applications will be accessible to anyone – even if they are on the go. Your employees will be able to attend meeting, edit their work, give presentations, etc. from their mobile devices on the go. Documents created via Office 365 can be stored online allowing people to edit, create, and share them with others easily. Files sharing is a breeze with everyone having access to files at anytime without having to worry about conflicted copies! Most importantly, all your data is completely secure. What you get with a Microsoft Office 365 Bundle? Impressed with the benefits of Microsoft Office 365? Want to boost your business with this office suite? Get in touch with getsix® Services today to help you grow your business!